Wildwood Ultimate › News › Breakmark 2018 Wildwood Team Order Deals! To order, contact Mat: sales@breakmark.com. Front Panel Tank $20/tank* A $5 savings! 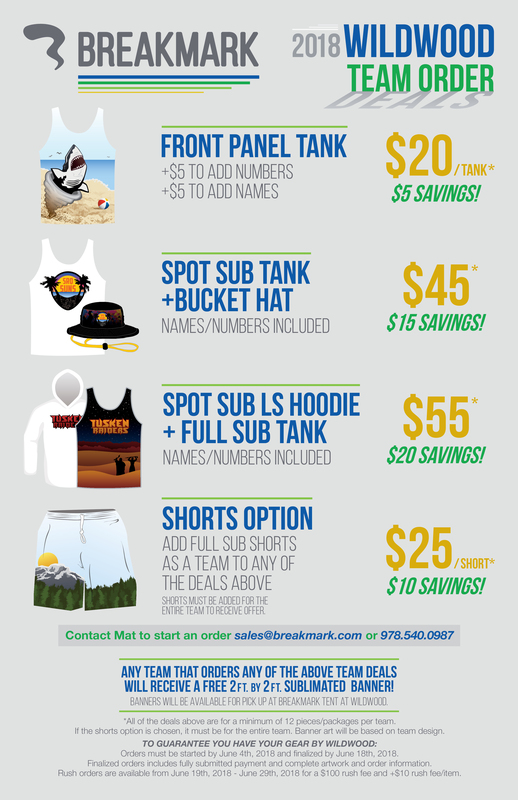 Spot Sub Tank + Bucket Hat $45* A $5 savings! Spot Sub LS Hoodie + Full Sub Tank $55* A $20 Savings! Shorts must be added for the entire team to receive offer. ANY TEAM THAT ORDERS ANY OF THE ABOVE TEAM DEALS WILL RECEIVE A FREE 2FT X 2FT SUBLIMATED BANNER! Banners will be available for pickup at the Breakmark Tent at Wildwood. *All of the details above are for a minimum of 12 pieces/packages per team. If the shorts option is chosen, it must be for the entire team. Banner art will be based on team design. Orders must be started by June 4th, 2018, and finalized by June 18th, 2018. Finalized orders includes: fully submitted payment and complete artwork and order information. Rush orders are available from June 19, 2018 – June 29, 2018 for a $100 rush fee and $10 rush fee/item.